I just recently signed up for NetFlix to get my videos over by mail. My wife in particular pointed out to me how nice the descriptions are being shown in a pop-up. Thereafter, I noticed that they have done super cool UIs all over their website. One of the things I got curious about was the way they showed descriptions of the movie by poping up a box with an arrow. The nice thing is that the box has a transparent shadow/glow in the back. I wanted to impress my wife and show her that this can be done easily. This article will show you how to show a pop up like the one mentioned above, both statically and dynamically by using the AJAX Control Kit's HoverPopUpMenu. The trick here is really simple: It's all about the transparent images! You can create a better looking one just by changing the images from the code download below. You want your box images to have a transparent background and created in png 32 format either in photoshop or fireworks, or your favorite graphic tool. With that said, let's move on to coding. The demonstration shown above was done statically, and of course, if you could code one thing statically, you you also generate these objects dynamically, thanks to ASP.Net. 2. Then drag a HoverMenuExtender control next onto the webform. Reference the Hyperlink above using the TargetControlID attribute of the HoverMenuExtender control as shown below. The OffsetX and OffsetY attributes tell us where to position the popup relative to the HyperLink. So if you want it to go closer to the left simply give the OffsetX and negative number, the bigger the number the closer it shows to the hyperlink, or in our situation here, we are showing an image, so the bigger the negative number, the closer the arrow is to the image. As you might have already guessed, giving the OffsetY attribute a positive value moves the popup up, and a negative value move it further down. 61 elit. Nullam at urna. Proin imperdiet hendrerit nibh. 64 himenaeos. Cras a lacus. Aliquam eros. 1. In the world of ASP.Net, if you can generate objects statically, you can of course generate these objects dynamically as well. As far as NetFlix or Blockbuster is concerned, they are not creating these popups one by one or statically, instead, they're getting the images, descriptions, titles, etc from a database. Whether they're retrieving these information from XML or MS SQL Server, these information is shown dynamically, therefore, the pop-up is also generated dynamically. Just to give you a very simple example of how to do this, I'm going to drag a PlaceHolder Server Control onto the WebForm. This PlaceHolder Server Control will serve as a container for the objects that we used above (Creating a Static PopUp): the HyperLink, the HoverMenuExtender, and the Panel Server Control. The PlaceHolder Server Control is all we need to demonstrate how to generate the pop-ups dynamically. 2. We will generate five (5) pop-up links inside a for loop. For loop is shown below: The first thing we will do is add the HyperLink Server Control Dynamically to the PlaceHolder object. Adding the HyperLink Server Control is simple enough, shown in lines 16-19. You will also notice here that I added the code "hl.NavigateUrl = "#";" in line 19, this is to ensure that the links we generate will be distinguished as a link (with a blue color and underline), else it will be just a regular black text. The most important part of the code here is highlighted in line 20. This is where we add the HyperLink Server Control to the PlaceHolder object. Note: Generating dynamic controls are normally done in the Page Init method of the web form, but since we're just generating controls that does Not postback, doing it in the Page Load event is just fine. Lastly, we will create a panel control dynamically. 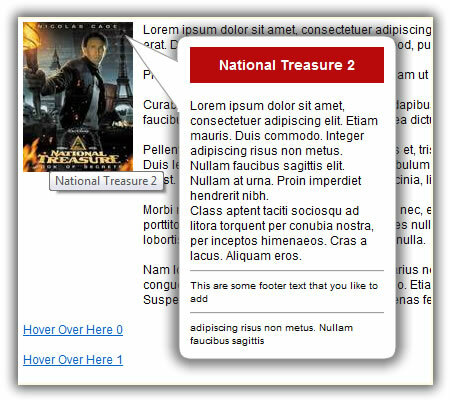 We will then build the string that will contain the style and text of the popup. You will notice that I used a StringBuilder object, then assigned the string representation of that object to a Literal Server Control shown in line 79. The Literal Server Control is then added to the Panel object shown in line 84. And again, the Panel Server Control is added to the PlaceHolder Server Control. Now that you know how to create a NetFlix/Blockbuster style pop-up dynamically, you can now be more creative and change the images that came from the code download below. It took less than 30 minutes to do the code, but the design of the box took me a lot longer since I'm really not a graphic person.